This is the classic meat lasagna recipe that you have probably had a variation of many times in your life. The meat sauce is the classic meat sauce base used in most Italian pasta recipes that can be altered for your own taste. 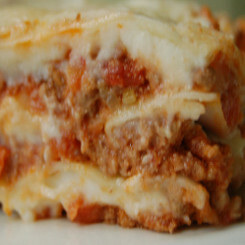 Every Mom, Dad, or Grandmother seems to have their own perfect recipe so start here and create your perfect lasagna. I like to add a tablespoon of Chutney substituting the wine with chicken stock to my meat sauce and sometimes a few fresh herbs that happen to be around the kitchen so send it and make your own. (Good for 4-6 people) Note: the meat sauce takes a while to cook but is well worth the time but if you have your own favourite meat sauce, use that. Add the butter to a pan on a medium heat and then add the onion, carrot and celery and cook until translucent and beginning to soften. Add the mince and cook until the mince has lost it’s pink color. You don’t want it to brown and in fact begins to look grey, this is good. Now add the wine or chicken stock, stir and allow to simmer until all of the liquid has evaporated. Stir it occasionally to make sure there is little or no liquid left. Now add the milk and nutmeg and allow to simmer again until the liquid has evaporated. Now add the tomatoes with all of their sauce, stir, reduce the heat to medium low and leave to simmer for about 3 hours stirring occasionally. If you notice the sauce sticking add a little more chicken stock. You really want to do this, it softens the meat and produces an incredible flavour. Heat your oven to 180 Celsius and begin the assembly. Use a 33cmx23cm baking dish and place a thin layer of meat sauce on the bottom, a layer of pasta sheets and then a layer of bechamel sauce. (I sometimes sprinkle a little cheddar cheese at this point). Repeat the process until you have completely finished the meat and end off with a layer of pasta sheets topped with bechamel sauce. Sprinkle over the parmesan cheese and into the oven for 40 minutes until browned and bubbling. That is the best Classic lasagna and meat sauce I have ever tried. You may want to try the Spinach and Ricotta lasagna recipe as well. Hi Graham, not sure if I am not looking properly but I cannot find your chicken lasagne recipe? I made this last night for supper. I was very good. Looks like I will be saving alot of money by making my own lasagna now. I’ve mentioned before that my mom-in-law cooks really REALLY well. So when we have a family gathering where we all have to “bring-a-cooked-dish” my nerves are normally shot! Thanks to the discovery of your site…not so much these days! I confidently volunteer a contribution. So I made this for the family the other day and lapped up the compliments! G, You’re my hero! Made this on Sunday, along with your Choc Profiteroles for dessert.. What a roaring success, the family loved it. Thanks for all the recipes, please keep ’em coming! Thank you for all the awesome recipes. I am ging to try the lasagna this weekend (the children are coming over) but I am going to attempt it with chicken. Hi Graham, Hope you are doing well. Just finished serving my family this delicious lasagna recipe, and it is sure gonna be one of our family favourites. YUMMY ! Thank-you for all your wonderful recipes. This sounds super ~ how many you reckons it feeds? The cooking time of 3 hours for the meat sauce is this correct?